What does an Orthodox temple look like? At first glance it may seem that temples are not similar to one another. Some are majestic and ornate, others are small and simple. Some are wide, others are narrow. Some temples have only one dome, others are decorated with many. However, despite these outward distinctions the interior of every temple is arranged by very specific rules. Upon entering you will know at once that you are in an Orthodox temple. Temples are built in many different forms. Most often we see temples in the form of an oblong rectangle. This form of the temple symbolically represents a ship, a means of transportation on the stormy waves of " the sea of life " to the final quay in the Heavenly Kingdom. What do we see, when we enter into a temple? Having entered into a temple, we ordinarily are in first of three parts: the vesibule or narthex. Sometimes, the vestibule it is separated from the main part of a temple by a glass partition with doors. Sometimes no partition is present. 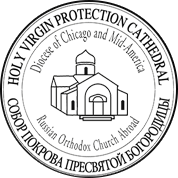 Usually, in the vestibule, most often on the right side, there is a counter where candles are on sale, prosphora are ordered, and donations for needs of a temple and the maintenance of clergy are accepted. 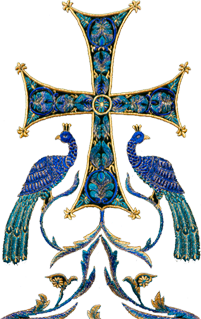 Ordinarily the Starosta - the person selected by members of the parish to be the main assistant to the Rector and duly appointed by the Bishop) will be behind the counter. The Starosta is responsible for the maintenance of the parish, maintaining order during the Divine services and religious processions, and organizing the decoration and cleaning of the church and grounds around the temple. Ordinarily assistants are selected to assist the Starosta in the performance of his/her duties. One of these is the treasurer who is responsible for maintaining the parish ledgers, finances and accounts and giving annual reports of the fiscal status of the parish. The main part of the temple is the nave where the parishioners stand during the Divine services. Here you will find icons on analoys (stands covered with vestments), and the candlestand upon which to place candles. Ordinarily in the temple you will find a large crucifix – the large cross with the image of the crucified Savior. Before this cross is normally a small table where Pannykhidas - short memorial services consisting of prayers for the departed - are conducted. In the temple are also special banners decorated with icons. These are on poles and are taken out during religious processions to be visible to the faithful. On the walls of a temple, and sometimes in other places, small wooden shrines decorated with ornate carvings are arranged, in which are contained especially revered icons. 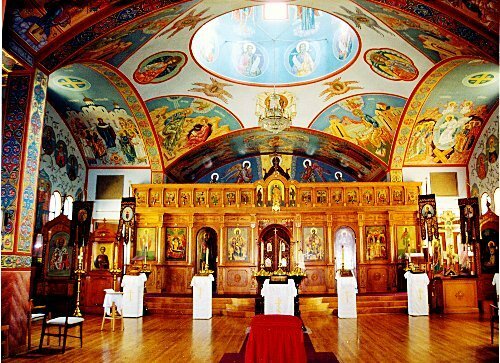 At the front of the nave you will see a special decorated wall called the Iconostasis. This separates the nave from the most sacred part of the temple, the Altar. Only clergy and their assistants, the alter servers are allowed to enter the alter. The Starosta and his assistants may enter but only after having received a blessing from the Rector. Women help on the kliros, in the choir, cleaning and decorating the church outside of the Altar. On the iconostasis, icons are arranged according to rules established by the Church. There are three entrances in the iconostasis. The central entrance is called the Royal Gates. Only clergy can pass through it. Normally the Royal Gates are closed and it is only during certain parts of the Divine services that they are opened. There is also a curtain behind the Royal Gates that is opened and closed during important parts of the the Divine service. On the right and left are doors – sometimes called Deacon Doors – because the deacon exits and enters them when he leaves the Altar to intone prayers on behalf of the faithful. Typically, the entire Altar is elevated above the remainder of the church in signifying the holiness of the Divine sacraments that are being served from therein. The platform before the iconostasis is called the soleas. This is an extension of the alter. The center of the soleas before the Royal Gates is called the ambo. It is often rounded off and extends further into the nave. Here the faithful receive communion and the clergy recite public prayers, read the Gospel and deliver sermons. On the sides of the soleas are found the kliros. Here readers recite psalms and prayers during the Divine services and where the choir sings during the weekday services. On Sunday and feast days the choir normally sings from a choir loft at the back of the nave. 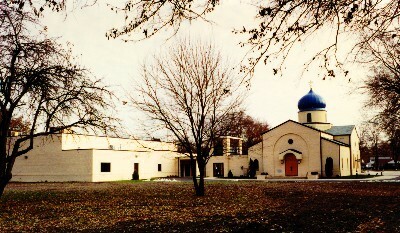 According to tradition an Orthodox temple is oriented east-west. The Altar should be located on the east end of the temple where the sun rises because our Lord Jesus Christ is refered to as “the Sun of Truth”, ascending in the east. Sometimes this arrangement is not possible, but if the opportunity exists, especially in new construction, this configuration should be followed.